There’s something very soothing about hearing and reading well-written poetry, so I was thrilled to be asked to hold a poetry assembly at Easton Royal Academy in Easton Royal, near Pewsey in Wiltshire. I’m very fortunate to be this charming village school’s Associate Author and it’s my second year in this post, so I know the school quite well. 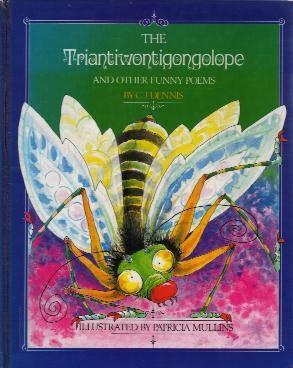 Now poetry is a rather vast topic, with numerous different types of poetry from acrostic poems to limericks, odes, riddles and sonnets, to name just a few. How on Earth was I going to narrow down this gigantic subject, into a 20 minute assembly? Well, the school’s current topic is ‘Into The Woods’, so I decided to read different types of woodland-related poetry to the children. This is also tied in well with my own ‘Whimsy Wood’ children’s books. The date of this requested assembly was yesterday, which happened to officially be the first day of Autumn. “A Ha!” I thought cunningly to myself! I shall also use this wonderfully colourful season as subject material for my assembly! But when you look for it again, you find it isn’t there. That I haven’t seen it either, and I don’t know its address. It’s just a little joke of mine, which you’ll forgive, I hope. It’s been said many times before, but it really doesn’t cost anything to simply say, “Thank you!” Yet these two little words can mean the world to the recipient. 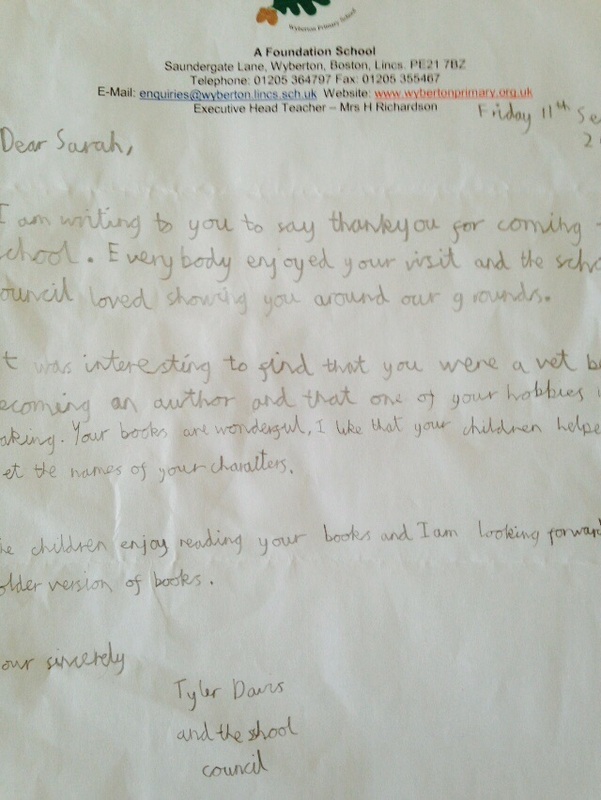 Take, for example, this wonderful letter that I received in the post this week, from Wyberton Primary’s school council, following my author visit to them recently. When I read this carefully written, thoughtful letter, I was filled with joy and a rather lovely, warm, cosy feeling. I didn’t stop smiling all day! With this in mind, it occurred to me how powerful saying, “Thank you” really is. I then started thinking about all the things that I am thankful for. Now I came up with quite a long list, which I won’t bore you with, but by simply looking around me when out walking across the fields near where we live, I was reminded how beautiful nature and indeed the seasons are. When fruit and berries grow. And a warm and sunny day. And crops to store away. I have been invited to Easton Royal Academy, to lead their assembly next week. This happens to be the school that I am ‘Associate Author’ for (and the second year running I’ll have you know! Something I am thankful for 😊) and they had requested some poetry. Since next Wednesday (the day my visit is planned for), is officially the first day of autumn, I shall be revelling in reading them numerous autumnal poems! I may even include a wee bit from Julia Donaldson’s ‘The Scarecrow’s Wedding’, which my children and I adore! Something else I am thankful for, is that ‘Posie Pixie And The Copper Kettle’, book 1 from my Whimsy Wood, is now available in hard back form! Please click on this link to the publisher’s website to order your copy! 😃 http://abelapublishing.com/posie-pixie-and-the-copper-kettle–book-1-in-the-whimsy-wood-series–hardback_p31204951.htm Before long, the other 6 books in the 1st set from my series, will also be available in hard back form. 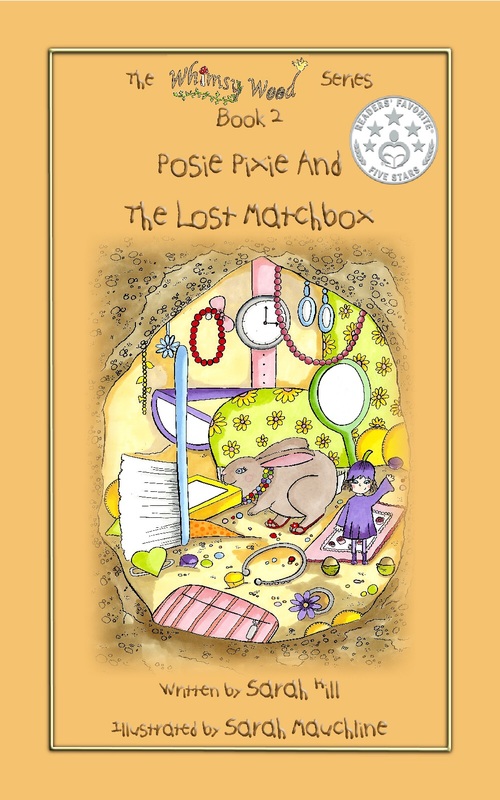 The next being book 2, ‘Posie Pixie And The Lost Matchbox’. Where does the time go? Another week has flown by in a blink of an eye and in the world of ‘Whimsy Wood’, we’ve managed to cram a fair bit in! First of all, I’m thrilled to say that I actually won a competition this week! Yes, little old me, who rarely wins anything! I entered a competition on Twitter to win a 3 month book prescription service with ‘Warm Vellum Books’ you see and low behold, I won it! The lovely folk at ‘Warm Vellum Books’ sent me a questionnaire to fill in, so they knew my interests, likes and dislikes. 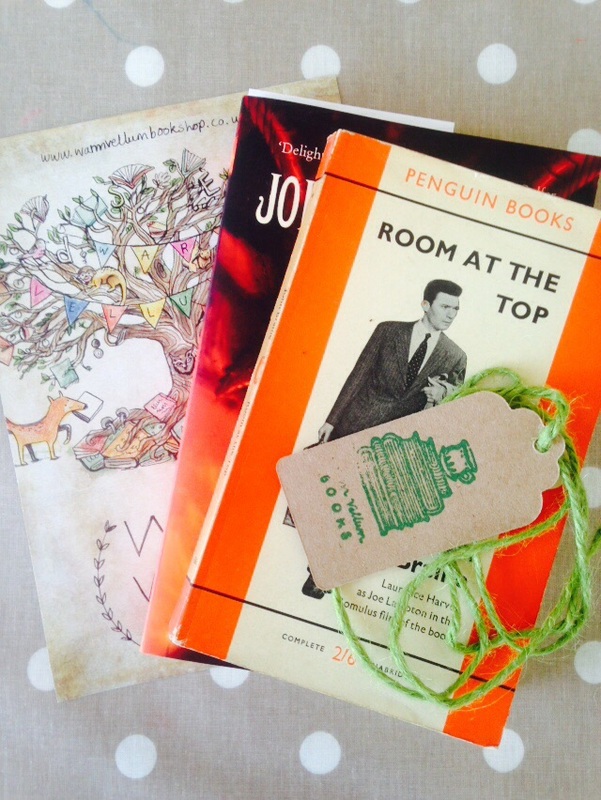 Then using this information, they sent me a suitable brand new reading book along with a very old Penguin classic book. 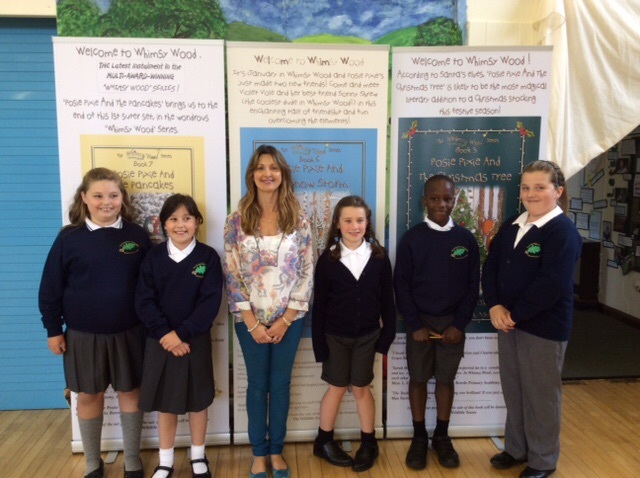 Finally, the other wonderful event that happened this week, was my author visit to Wyberton Primary School in Lincolnshire. I always feel incredibly privileged to be invited into primary schools in the UK, to spend time with the children doing literacy-related woodland activities. This week’s visit was just as joyous! Well the house is rather quiet today, as my oldest 2 daughters went back to school this morning (after having a fabulous summer!) and my 2 year old son is in nursery. This of course means that I should be ‘knuckling down’ to do some writing on my ‘Whimsy Wood’ children’s series…..Hmmm….yes….that’s all very well, but having a nosy through my new bedtime read is proving to be terribly distracting! This brilliant book in question is ‘The Shepherd’s Crown’, which is Terry Pratchett’s final discworld novel. He really is my absolute favourite author and I was rather delighted that this cracking page-turner was released on my birthday last Thursday! 😃 If you’re not familiar with the quirky discworld, then here’s a snippet of this splendid story to give you a taste…..
Terry Pratchett’s final discworld novel, ‘The Shepherd’s Crown’. 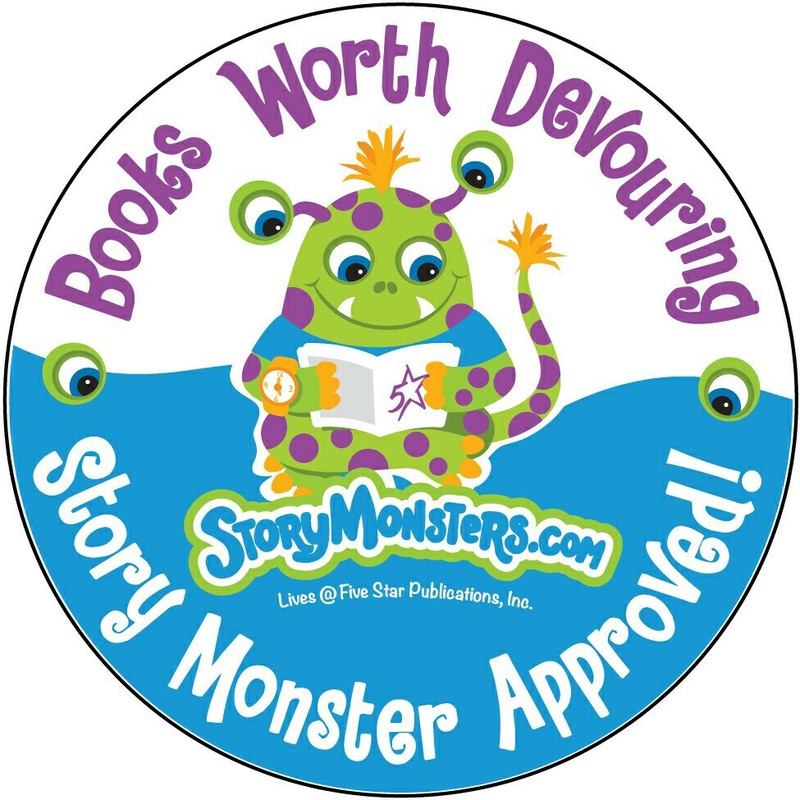 On the subject of books, I was delighted to learn that ‘Posie Pixie And The Snowstorm’ and ‘Posie Pixie And The Pancakes’, my 6th and 7th ‘Whimsy Wood’ children’s books, have been awarded the ‘Story Monster Approved’ medal! Finally, on Monday September the 7th, my ‘Whimsy Wood’ characters and I will be making our first school visit of this term. We’ve been invited to spend the day with all the pupils at Wyberton Primary in Lincolnshire. I have all sorts of whimsical fun and frolics planned for this author visit and I can’t wait!